As an Associate Editor of over a dozen journals, I have seen an increase in the number of submitted articles with multiple authors. I enjoyed seeing that Economics & business were included in the list of scientific fields especially since my areas of research include Management Science & Operations Research and, on many days, Network Economics. In the past 30 years, as the above table reveals, there has been a precipitous drop in the number of single-authored papers. 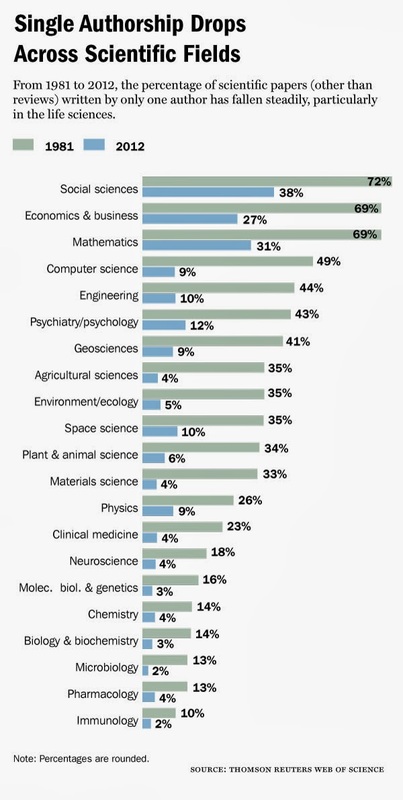 In Computer Science, for example, only 9% of the 2012 scientific articles were single-authored, whereas, in Mathematics, the percentage of single-authored papers in 2012 was 31% with the Social Sciences having the highest percentage of 38%. A paper by Ding, Levin, Stephan, and Winkler, published recently in Management Science, had some fascinating facts: A number of studies have identified a significant increase in the number of coauthored papers by individuals at different academic institutions and in different countries, as well as in the number of coauthors per paper. An analysis of approximately 13 million published papers in science and engineering from 1955 to 2000, for example, found an increase in team size in all but one of the 172 subfields studied, and average team size was found to have nearly doubled, going from 1.9 to 3.5 authors per paper (Wuchty et al. 2007). Adams et al. (2005) found similar results for the top-110 research universities in the United States, reporting that the average number of authors per paper in the sciences grew by 53.4%, rising from 2.77 to 4.24 over the period 1981–1999. university—and an increase in lab size—but more importantly to an increase in the number of institutions collaborating on a research project. A study of 662 U.S. institutions that had received National Science Foundation (NSF) funding one or more times found that collaboration across these institutions in science and engineering, which was rare in 1975, grew in each and every year between 1975 and 2005, reaching approximately 40% by 2005 (Jones et al. 2008). Collaboration has increased internationally as well. The Levin et al. (2009) study of authorship patterns across a wide array of four-year colleges and universities in the United States found that the percentage of papers with one or more international authors went from 6.6% in 1991 to 19.2% in 2007. I recall my dissertation advisor at Brown University, Professor Stella Dafermos. Her many papers published mostly in the 1970s and 1980s were mainly single-authored except for earlier ones with her dissertation advisor and several with her doctoral students. I recall also being told that it was important to have single-authored papers before promotion to Associate Professor and tenure. Luckily, I achieved both at UMass Amherst just 4 years after getting my PhD at Brown. These days, interestingly, several of my former doctoral students were urged (and are being urged) to have one or more single-authored papers before they come up for promotion and tenure whereas I know of folks who are up for tenure that have never published a single-authored paper (all these cases I am mentioning have PhDs in the Management Science/Operations Research/Industrial Engineering/Operations Management areas and are in business schools). Some are also told that papers with their advisor do not count "as much." Of course, there is also the pressure to publish in "premier" and "A" list journals. I continue to write single-authored papers but very much enjoy collaborations and working also with doctoral students (present and former) as well as with other colleagues across the globe. And these days, with a very tight deadline -- of tomorrow -- we are trying to finish a paper with 7 co-authors (based on our NSF project). Thanks to Marc Abrahams in his, Scientists Find Safety in Numbers, for noting that: "If there were a prize for the largest number of co-authors, it would have gone to the 2,512 people credited with writing "Precision Electroweak Measurements on the Z Resonance," which appeared in the journal Physics Reports in 2006." He also reminds us that: "at least one prize has been awarded for the highest number of co-authors. In 2003, the Ig Nobel prize for literature went to the approximately 976 co-authors of a medical study published in the New England Journal of Medicine. That paper also had the distinction of having 100 times as many authors as pages." The "optimal" number of co-authors will depend, hence, on the project/problem and very much on the field and subfield. Coauthors may provide expertise, proper instruments, act as sounding boards and assist in the data analysis, etc. Also, the "optimal" number of co-authors may depend on what stage one is in one's career and the expectations of your environment. Clearly, the data show that single authorship of scientific articles has decreased dramatically. Let's, nevetheless, hope that we are still educating students who "can stand on their own feet," if need be. First, I hope that all those celebrating had a very pleasant Thanksgiving and for all those who still have journeys ahead of you, I wish you safe and comfortable travels! 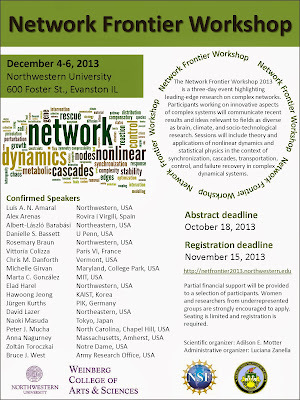 Next week, I will be speaking at the Network Frontier Workshop at Northwestern University. This should be a fascinating event and has been organized by Dr. Adilson E. Motter. The workshop will bring scientists from different disciplines together who are passionate about networks and are contributing to their study and understanding in numerous ways. The full list of invited speakers can be seen here. The full program with all speakers' talk titles is available in pdf format here. After the great TEDx UMass Amherst Professor Speaker Showcase event last Monday at which I spoke on The Traffic Circle of Life I started to prepare my presentation for Northwestern. A Network Economic Game Theory Model of a Service-Oriented Internet with Choices and Quality Competition, Anna Nagurney, Dong Li, Tilman Wolf, and Sara Saberi, Netnomics 14(1-2): (2013) pp 1-25. ChoiceNet: Network Innovation Through Choice, George N. Rouskas, Ilia Baldine, Ken Calvert, Rudra Dutta, James Griffioen, Anna Nagurney, and Tilman Wolf, invited paper for the 17th Conference on Optical Network Design and Modeling (ONDM 2013). Choice as a Principle in Network Architecture, Tilman Wolf, Jim Griffioen, Ken Calvert, Rudra Dutta, George Rouskas, Ilia Baldine, and Anna Nagurney, in the Proceedings of ACM SIGCOMM 2012, Helsinki, Finland, August 13-17, 2012. I will be focusing my presentation on one of our most recent papers: A Cournot-Nash–Bertrand Game Theory Model of a Service-Oriented Internet with Price and Quality Competition Among Network Transport Providers, Anna Nagurney and Tilman Wolf, in press in Computational Management Science. 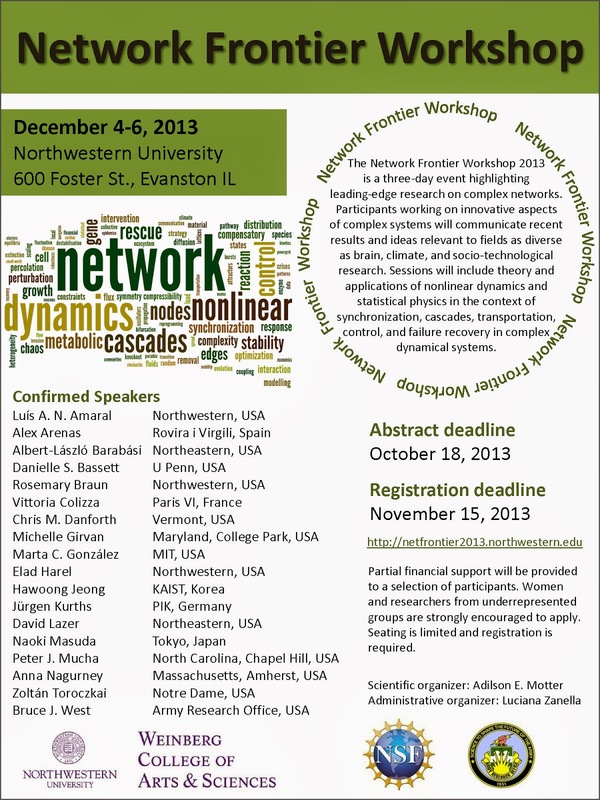 I am very much looking forward to being back at Northwestern! Many are traveling these days to reach their destinations to celebrate Thanksgiving Day tomorrow with family members and friends.The weather has not been auspicious, which, according to CNN, threatens holiday travel. I am reminded of one of my favorite "transportation" movies starring Steve Martin, Planes, Trains & Automobiles. But this is a celebratory post about Thanksgiving and about some of the logistics behind an event that has been occurring since 1924 -- the Thanksgiving Day Macy's parade in NYC. The parade is televised on Thursday morning, and is over around noon. Many families that are not taking part in it or spectating may be watching it on TV as the turkey and other delicacies are being prepared and cooked! We always try to catch about an hour of the parade especially the last hour. This year the parade is extra special since the UMass Amherst Minuteman Marching Band will be one of only two college bands selected to march in the Macy's parade. The other one is James Madison University's band. Our band is known as The Power and Class of New England and was led for thirty years by George Parks. For those of you who may have missed the news, UMass is celebrating its sesquicentennial, that is, its 150th birthday! And this special year may be why, as noted by our wonderful alum and MA State Senator, Stan Rosenberg, we got selected. (He did put in a plug for the band.) And our Chancellor has noted in a statement that participating in this annual tradition will be a highlight of the university’s 150th anniversary. “Being selected for the Macy’s Thanksgiving Day Parade is a high recognition of our band’s reputation for excellence and excitement,” Subbaswamy said. UMass Amherst issued a nice release on its selection and when you are all cozily tucked in tonight the band will be up with a schedule that will certainly be challenging (but it is all about logistics). As the article in our local paper reports: The 2½-mile march on the streets that takes about 60 to 90 minutes, is much longer than a 15-minute football halftime show. The members expect to wake up by 3 a.m., be at Macy’s by 4 a.m. for a run through and final rehearsal, then take buses to the top of the route and be there by 7:45 a.m.
During the parade, the marching band will have to play constantly, with a cycle of four songs including “Fight UMass,” “God Bless America,” “Roll Down the Field” and “Sweet Caroline.” Ramsay said this will be a tribute to the Boston Red Sox. The marching band ends its day with the featured number at the Macy's star. It is scheduled to be there at 11:24AM on Thanksgiving! Rain, snow, or shine, the show and parade will go on (but perhaps if the wind gets bad there will be no huge balloon floats). First, THANK YOU to the students who organized last night's TEDx UMass Amherst event: Professor Speaker Showcase! Thanks also to all the students who came and energized the speakers with their enthusiasm, applause, and presence during a cold November night just before Thanksgiving. My wonderful doctoral students were behind the photos taken and posted below at the TEDx event. I am sure that more will be posted on other sites. The inspiration gained and words of wisdom exchanged I know will support many of us. The full list of speakers and their presentation titles can be found below. 6:15 - Cynthia Barstow on "Nurture Your Nature"
6:30 - Peter Skott on "Power, Luck, and Ideology"
6:45 - Anna Nagurney on "The Traffic Circle of Life"
7:00 - Ryan Wright on "Mindfullness Use of Tech"
7:25 - Shaheen Pasha on "What's Your Story?" 7:40 - Brian O'Connor on "Desiderata"
7:50 - Pierre Rouzier on "Community Involvement"
8:05 - Susan Whitbourne on "Achieve Your Goals by Tweaking Your Mindset"
8:20 - Snacks, Questions, and Networking. 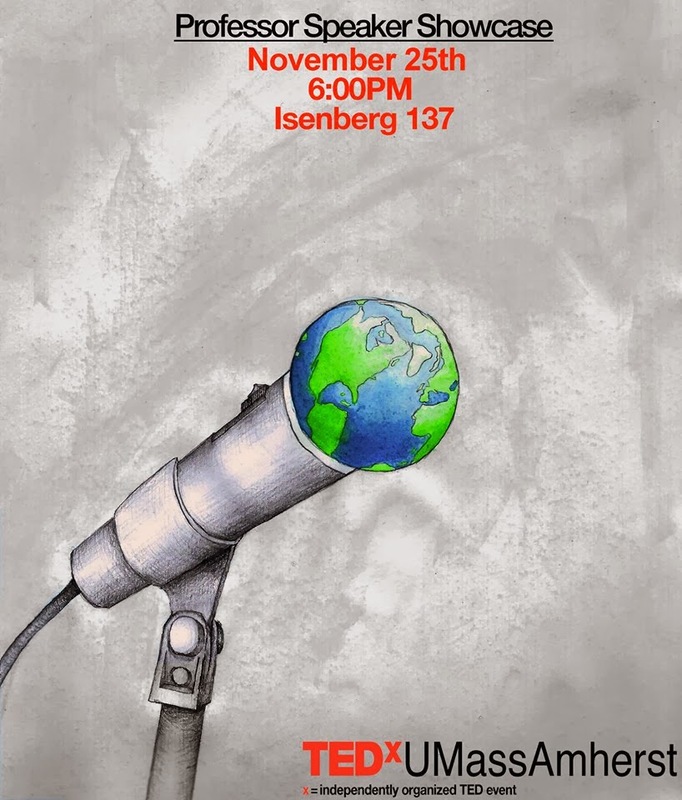 Tomorrow is the TEDx UMass Amherst event: Professor Speaker Showcase, which will take place in the Flavin Auditorium at the Isenberg School of Management from 6-8PM. The organizers -- a group of visionary students at UMass Amherst -- are doing all the logistics, publicity, and event management for this event. Plus, several of the TEDx team members have interviewed the faculty involved multiple times! The students have created a nice Facebook page and, in dramatic fashion, have been announcing one speaker per day, beginning a week ago, with the full list available tomorrow. There are 8 speakers -- 4 males and 4 females, which is great. Students submitted nominations of the professors they want to hear speak outside of the classroom setting, so this makes the event extra special. There will be two faculty from my Operations & Information Management department, Dr. Ryan Wright and I, and one from the Marketing department, Cynthia Barstow. This makes 3 faculty out of 8 from the Isenberg School of Management! The others who are officially identified (I also know #8 but will keep the name a secret until the announcement): Dr. Susan Whitboune of Psychology, Dr. Brian O'Connor of Biology, Dr. Shaheen Pasha of Journalism, and Professor Peter Skott of Economics,. I put some finishing touches on my presentation today and am very much looking forward to speaking tomorrow evening. I have heard that there will even be a red carpet and a musical ensemble from the Berklee College of Music in Boston! Last Friday, we had the pleasure and honor of hosting Dr. Mary E. Helander of IBM Yorktown Heights at the Isenberg School of Management through our UMass Amherst INFORMS Student Chapter. I help the students to organize chapter activities and since Dr. Helander wanted to visit us, we decided to do something a bit different. The event was so successful that one of the students present said afterwards: "Professor Nagurney we have to have more of these Q&A sessions!" Amazingly, it was almost entirely a female audience! Dr. Helander told the students that they could ask her ANY question. First, some background on Dr. Helander. She is on the program committee of the INFORMS Conference on Business Analytics and Operations Research that will take place in Boston next spring. She is a Master Inventor and Research Scientist and is currently the IBM Research Division leader for Consumer Products. Presently, she is the technical lead for two interdisciplinary research projects involving food safety and traceability. Not only does she hold a PhD in Operations Research but she is also a Docent in Quality and Software Engineering from Linkoping University in Sweden. At lunch she and I talked about living in Sweden and she told me some mesmerizing stories about her surname -- I'll let you do the research -- another movie should be made. The Edelman Award is like an Academy Award for analytics and operations research, so although her team did not win to be a finalist is a huge achievement! From Mary we learned a lot about IBM, and about her research and contributions there. We learned about functional foods and microtoxins and my favorite takeaway and quote from the Q&A session. Mary said: People that you work with will bring you joy. Frankly, I think that it is Dr. Mary Helander who is making such a positive impact on all those around her and beyond through her great operations research contributions and dynamic personality, which the students really appreciated! Thank you so much, Dr. Mary Helander, for coming to the Isenberg School at UMass Amherst! You are an operations research rockstar! What an Amazing Week - It's All About Our Students! Anyone who thinks that professors have a life of routine and their weeks are just punctuated by the classes that they teach are completely wrong. If you like a predictable routine each day then being an academic is certainly not for you. On the other hand, those of you who crave novelty, excitement, interactions with fascinating people, the exchange of new ideas as well as dynamism and being surrounded by energy and activity, then being an educator and a college professor is a dream job. What makes being a college professor so special is the students and all that we do is really for the students! This week is one of those weeks that highlights the span of activities that a fculty member is engaged in so let me tell you what we have been up to. On Monday, I was videotaped by a UMass Amherst undergrad who is a member of the Isenberg School of Management Marketing Club for an Isenberg Youtube series that the club started on Meet the Professors. The students are editing my interview and it will be posted soon. I got to hear about the student's major and we reminisced about New Jersey, where he is from. The extracurricular activities that our students are engaged in are diverse and they acquire numerous skills through them. Then, after meetings with advisees and doctoral students, it was time to march across campus for a search committee meeting. I am serving, with my great colleagues in Mechanical and Industrial Engineering, on a faculty search for an Assistant Professor in Systems Engineering. We went over the piles of applications and reached a consensus as to the top candidates, which was gratifying. There are fabulous PhD students out there. We will be very busy with their visits and interviews in the coming weeks. And if you want to see how in demand systems engineering expertise is just read about UTC's gift of $10 million to UConn to create an institute with faculty positions. On Tuesday, I taught my OIM413 Logistics and Transportation class, which I love teaching and will soon be teaching a class today, as well. The students are now identifying the topics that they will be doing their project papers on. These will be individual projects, rather than team projects, due to the late Thanksgiving this year and only one week of classes afterwards. I worked on a rubric (never had one of these in my Brown University days) to help them with their papers. Then, after more meetings it was time for our "weekly" National Science Foundation (NSF) project teleconference. Our project: Network Innovation Through Choice is one of 5 Future Internet Architecture projects selected by NSF. Our project team, consisting of Professor Tilman Wolf of the College of Engineering, me, and our doctoral students, with Professors Ken Calvert and Jim Griffoen of the U. of Kentucky, Professors Rudra Dutta and Georre Rouskas of NCState, and Dr. Ilia Baldine of the Renaissance Institute at UNC, and their students, is working on a new Internet. We discussed the recent Principal Investigators Meeting that took place in San Diego and you can view the presentations (ours was given by Dr. Dutta) here. 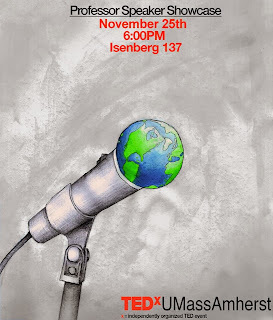 Then it was time to complete my talk for the TEDx UMassAmherst Professor Speaker Showcase, which takes place next Monday, November 25, in ISOM's Flavin Room. Students had nominated me for this special event and I am so honored and excited to be part of it. On Tuesday, some students had made an elaborate colorful announcement in chalk in my classroom, which was such a surprise -- I was redder than the bright red jacket I wore that day! On Wednesday, I received a wonderful message from the Founding Editor of the Goteborg Daily, which is an English language newspaper published in Sweden's second largest city, sometimes also spelled and pronounced as "Gothenburg." My interview was published with photos and it brought back so many memories. Many nice messages followed from colleagues and students in Sweden, Austria, and the U.S. (and even from a few thoughtful top administrators) who had seen the article -- Thanks for the support! My TEDx talk "completed," I met with several of the organizers of this event -- the students are so creative and their attention to detail is impressive -- there will be a red carpet, a spotlight, and even music provided by a group from the Berklee College of Music in Boston! We went through my talk and discussed the background, etc. Plus, I was videotaped also for this event. As one of my doctoral students said, "You always have to look fresh, Professor!" Then it was time to discuss another pending project with fellow faculty and when I arrived home, after also meeting with a student about her doctoral dissertation proposal, I found in my mailbox a new book that I will be blogging about -- will keep you in suspense as the TEDx folks are doing in announcing one professor speaker each day before next Monday's gala event! Plus, I heard wonderful news from a student in Vienna, Austria, who had taken my Humanitarian Logistics and Healthcare intensive short course that I taught at the Vienna University of Economics and Business last March (while on sabbatical in Europe). He had been accepted into its doctoral program to work under my former doctoral student, Tina Wakolbinger, who is now a Full Professor there -- I had written him a letter of recommendation -- so happy about this great outcome! Today, Thursday, after teaching my class, I will be getting ready for two big events tomorrow. I am serving as a co-supervisor of a doctoral dissertation at the School of Business, Economics and Law at the University of Gothenburg, and, tomorrow, Friday, the student, Niklas Arvidsson, will be defending his dissertation. I will be Skying in early in the morning for the defense. I have been very much enjoying reading his dissertation and attended his Kappa when I was in Gothenburg. The dissertation includes 5 papers that he has published on the overall theme of sustainable freight, which I am very interested in. After Niklas' defense I will be off to support the students of the award-winning UMass Amherst INFORMS Student Chapter, since we are hosting Master Inventor Dr. Mary Helander of IBM with a reception at 10:30AM in the Isenberg School followed by a one hour Q&A. Then Mary and I will go out to lunch. She has a PhD from Sweden so her visit will be quite special for all of us! Do you remember when you had to choose your major in college? Perhaps you knew before you even were a freshman your passion and what you wanted to concentrate in and you just charged forward. Maybe you knew what you liked in general (and what you did not like, which is very useful to know and can save you a lot of wasted time and effort) but you needed several courses in college to identify your focus. Now is the time at the Isenberg School of Management at UMass Amherst, where I teach, when students declare their major. Those who are lucky enough to already be enrolled at the Isenberg School have sampled a spectrum of business courses as well as other courses as part of the curriculum. With our rigorous curriculum that emphasizes both breadth and depth students quickly identify whether they are quant and analytical types, or, perhaps, more interested in behavioral and managerial issues, or focused on specific industries -- at the Isenberg School we also have the renowned Hospitality & Tourism Management Department and the Mark H. McCormack Department of Sport Management. But this post is about Operations and Information Management (OIM). 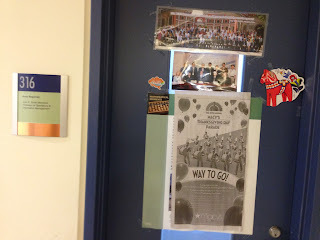 My regular readers know that what was the Department of Finance and Operations Management at the Isenberg School is now two departments, so my new "home" within the school is Operations & Information Management. OIM students, faculty, and professional are problem-solvers who apply state-of-the-art concepts, methods and tools, as well as technology. OIM is about systems, that is, firms, organizations, or networks of firms as in the case of supply chains, and in making them operate better, whether through cost reduction, enhanced efficiency and profits, improved product quality and innovations, redesign, improving sustainability, or even making more timely deliveries. Students learn about exciting industries from pharmaceuticals and healthcare to transportation and logistics to food and even fashion! They learn optimization techniques and analytics! Some courses, but not all, are highlighted here. For example, the methodologies that students learn and apply can be used also in other problem domains, including in humanitarian logistics, a course that I developed and teach and have even offered last Spring, while on sabbatical, in Europe. The OIM major is challenging, and hands-on with truly gifted and dedicated educators who are at the frontiers of their disciplines and are dynamic and engaged. We bring in guest speakers and have also student clubs from the newly formed OIM Club to the UMass Amherst INFORMS Student Chapter, that I have been a Faculty Advisor of for almost a decade (time to celebrate). Our students have fascinating internships at such companies as IBM and UTC, to start, and get excellent jobs -- thanks, in part, to our terrific Chase Career Center. We have been told that OIM majors command the second highest average salaries among the majors at the Isenberg School, after graduation! You can try to guess the top salary earners (and it is not Finance). 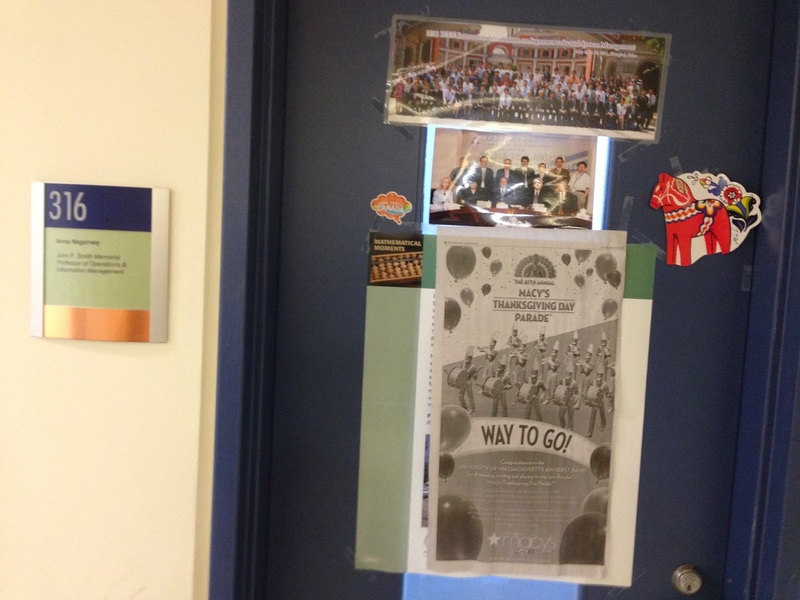 And the best part of the OIM major is the caliber, energy, and dedication of the students that we attract. Our students are wonderful and I am so glad to be part of this community! After they graduate, they continue to succeed and to make the world a better place. Many stay in touch and, after a few years, some even apply to grad school. I returned from Atlanta, Georgia around 1AM this morning. As I wrote in my previous post, I was at the 60th North American Meetings of the Regional Science Association International (RSAI) . I flew out this past Thursday, after teaching my undergraduate Logistics &Transportation class at the Isenberg School. I had a very busy time at this great conference. I think that Professor David Plane of the University of Arizona, who is an RSAI Fellow, and a wonderful regional scientist, geographer, and demographer, said it best in his essay in the November 2013 RSAI newsletter about what is great about regional science intellectually. He stated that: I believe regional science offers “an almost perfect disciplinarily neutral meeting ground.” As in Walter’s vision, it continues to attract top minds bringing technical prowess from many directions to important societal issues of space and location. And the plain and simple style of regional science – it’s all about the scholarship and collegiality without the extraneous trappings of other disciplines and groups – has engendered remarkable loyalty among its adherents. Of course, "Walter" is none other than the founder of Regional Science, Walter Isard, and, in Atlanta, we honored his memory in two special sessions, the second of which took place yesterday and at which I delivered the paper, An Integrated Disaster Relief Supply Chain Network Model with Time Targets and Demand Uncertainty, Anna Nagurney, Amir H. Masoumi, and Min Yu. I also discussed the recent Haiyan typhoon in the Philippines during my presentation and the relevance of our model to the preparedness and response phases of disaster relief. The photo below was taken after the session and includes the speakers, an organizer, and discussants. And, the day before, I had the pleasure of listening to the great presenters in a special session that I organized in honor of Professor David E. Boyce's 50th consecutive attendance at this conference, dating back to his first in 1964! We had the photo below taken of the presenters after this special session.. Professor Boyce is in the bright red tie and smile. Detailed information on these sessions, the speakers, and their paper titles can be found in my previous post. Also, Professor Boyce was recognized with a special plaque at yesterday at the Awards Luncheon in Atlanta and a major donation was given in his name to the Benjamin Stevens Graduate Fellowship Fund. Professor Ben Stevens was Professor Boyce's dissertation advisor at UPenn and Boyce spoke about how Isard and Stevens mentored him and how now he does the same for others (and has done so for many years). I definitely concur with David Plane's statement about the scholarship and collegiality surrounding the discipline of regional science and I would also add the mentorship of many of its senior members who are also terrific advocates of colleagues, both junior and senior. It was great to see friends from around the globe and to get such positive and worthwhile comments on the papers presented. This conference has a very nice model of also having a discussant for a paper. Professor Walter Isard would have been very proud at the success of this conference (the lunch was also delicious) and to see his amazing legacy living on after his passing. And, as for the Memorial volume that is being guest edited by Professors Peter Nijkamp and Adam Rose, we are so honored that our paper, noted above, will be in it (after we incorporate some feedback) and the Nobel laureate, Paul Krugman, also will have a chapter in it, which I noted previously on this blog. I am getting ready for the 60th Annual North American Meetings of the Regional Science Association International, which are taking place in Atlanta, Georgia, November 13 -16, 2013. My two talks are prepared and a session organized. My presentations are uploaded to the Supernetwork Center website. The session that I organized is in honor of Professor David E. Boyce, who is both an RSAI Fellow and an INFORMS Fellow (He and I are the only Fellows of both of these societies). This will be Professor Boyce's 50th consecutive such conference -- He considers himself lucky and we are thrilled to be honoring him in Atlanta for his scientific leadership and mentorship. Shrinking Global Population ‐‐ a Futuristic Scenario or a Current Challenge, Hillel Bar‐Gera, Ben‐Gurion University of the Negev. Cluster Dynamics: Structural Properties of Cluster Life‐Cycles and Public Policy, Roger Stough, George Mason University.  Tschangho John Kim, University Of Illinois. The Process of Regional Economic Growth: A Modeling Perspective, Richard S. Conway, Jr.
 Geoffrey Hewings, University of Illinois ‐ Urbana‐Champaign. The full conference program can be directly accessed here. Mark your calendars! 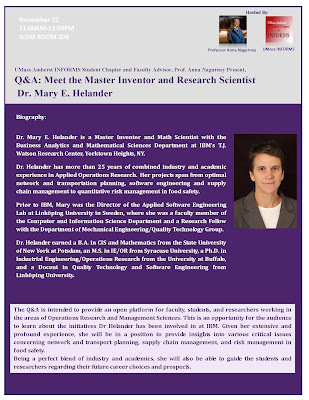 On Friday, November 22, the UMass Amherst INFORMS Student Chapter and I will be hosting IBM Master Inventor Dr. Mary E. Helander. According to Wikipedia: An IBM Master Inventor is an individual selected by IBM. The qualification and appointment to Master Inventor is governed by the value to IBM of an inventor's contribution to the patent portfolio, and through defensive publication (published in www.ip.com). IBM weighs many aspects of an inventor's contributions, including but not limited to impact of invention through licensing, inclusion in product, and percentage of patents with a measurable impact. IBM also considers an individual's contribution to the inventing community inside IBM, whether by acting as a patent reviewer, or providing feedback and guidance to new inventors. Dr. Helander will be welcomed with a reception in Isenberg School Room 206 beginning at 10:30AM and the Q&A will follow at 11:00AM until noon. I met Dr. Helander at an INFORMS Conference in Puerto Rico and, a few years back, in the Fall of 2009, she visited us and spoke at the Isenberg School on Food Safety in a Global Supply Chain. I wrote about her previous visit on this blog. I would also like to take this opportunity to congratulate Dr. Helander on her receipt of the 2013 Minerva Award from SUNY Potsdam! Yesterday, I reminded the students in the undergraduate Logistics and Transportation class that I am teaching this semester of recent natural disasters that affected us regionally from Superstorm Sandy in 2012, to the freaky Halloween snowstorm in 2011 (with power out for days on our area), to the once in 500 years flood, as a consequence of Hurricane Irene, also in 2011. I also remarked that, thus far, this academic year has been relatively free of natural disasters in New England and Massachusetts. I was speaking on how what we have learned in the course, to-date, including the network performance measure that I described yesterday, based on work done with Dr. Patrick Qiang. The network performance measure is known as the N-Q measure (for Nagurney-Qiang) and can be applied to identify the most important nodes and links in transportation and logistics networks, including supply chains, since their removal from the network has the biggest impact on the network's performance. The most important nodes and links are those that should be protected the most and also restored post disaster the quickest. Our measure has been applied to identify the most important highways in Germany by Schultz, whether to build a new subway line in Dublin, Ireland, and even to assess the impacts on transportation of the major fires that struck Greece several years ago. However, just because your region or even country is not presently experiencing (or working to recover from) a disaster, does not mean that people elsewhere are not either preparing, enduring and suffering from, or working towards recovering from one disaster (or several). 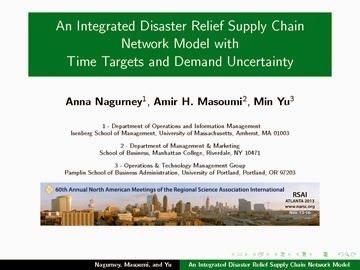 Next week, at the 60th Annual North American Meeting of the Regional Science Association International, which is taking place in Atlanta, GA, I will be giving a presentation on "An Integrated Disaster Relief Supply Chain Network Model with Time Targets and Demand Uncertainty," based on the paper of the same title, which is an invited paper for the Memorial Volume in honor of Professor Walter Isard, the founder of Regional Science. A preprint of the paper may be accessed here. Our presentation may be downloaded here. The paper is co-authored with Professors Masoumi and Yu, two of my former doctoral students. Our disaster relief supply chain network model captures both the preparedness phase and the response phase of the disaster management cycle (with the other two phases being mitigation and recovery). Also, in contrast to many of the models in the existing literature, our model does not consider targets for cost; instead, it minimizes the total operational costs of the activities in the supply chain network. This, we believe, makes more sense in that the relief operations budget largely depends on the intensity of damage and the fatality toll which may be difficult be determine a priori. In addition, our model allows for the pre-disaster and the post-disaster procurement of relief items, and involves the time and the cost associated with each strategy or a combination of both. Also, we handle nonlinear costs, which capture congestion effects, a big issue in disaster relief, and an aspect that has been missing from much of the literature on the topic. 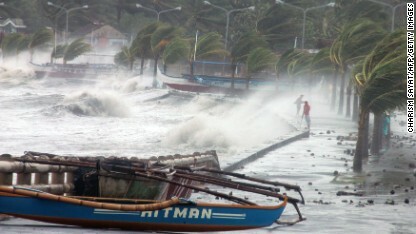 According to The Washington Post: The Philippines, which is hit by about 20 typhoons and storms a year, has in recent years become more serious about preparations to reduce deaths. Public service announcements are more frequent as are warnings issued by the president and high-ranking officials, regularly carried on radio and TV and social networking sites. Provincial governors and mayors have taken a hands-on approach during crises, supervising evacuations, inspecting shelters and efforts to stockpile food and relief supplies. After this megastorm has passed, we will see whether the efforts minimized losses in life, if not property, given the severity of the winds and rain. Yesterday, at the Isenberg School of Management, we had the distinct pleasure of hosting Dr. Les Servi of MITRE, who is an INFORMS Fellow (and whom I have known since our days at Brown University as undergraduate students). Dr. Servi delivered a brilliant talk on his latest research on the topic: Analyzing Social Media Data Having Discontinuous Underlying Dynamics. Dr. Servi's presentation was part of the UMass Amherst INFORMS Speakers Series, which the Student Chapter helps me to organize and to host. His talk was on his paper in Operations Research Letters, just hot off the press, and published in the November issue. The paper begins with the statement, which immediately captures your interest (as did his talk): Although physical objects follow well understood Newtonian physics and are free of discontinuous dynamics, emotional intensity dynamics evolve continuously with unknown dynamics until a tipping point or external event triggers a discontinuity. In his presentation, Dr. Servi asked whether anger has dynamics (the same about sadness and positive emotions). Is there a formula that can capture the anger of citizens and is there a momentum associated with anger? He concluded that sadness (and other emotions) follow dynamics that are different from those of rockets since there are discontinuities. His paper not only presents a model for a more nuanced dynamic for emotions but also a dynamic programming algorithm to solve the associated optimization problem that identifies times of emotional discontinuities. He then illustrated the new method for the analysis of mood shifts reflected in 380,000 Twitter messages related to one of the world’s most popular soccer teams, Manchester United, during their 2011–12 season. He was impressed that so many in the audience at the Isenberg School knew of this team and its sport (a finance audience at a talk he gave in Boston did not recognize the team). And what Dr. Servi discovered through analyzing the data was fascinating and not what one would expect immediately. 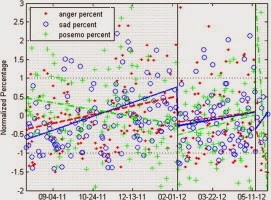 The figure below displays the Mood Shift Analysis of the Twitter messages showing a breakpoint on 2/6/2012 and 5/14/2012. The discontinuities in mood associated with certain dates were not due to wins or losses of one of the world's most popular sport franchises (and one student in the audience had been to Manchester games) but one marked the anniversary of the following event: the tipping point found on February 6, 2012, might be due, according to Dr. Servi, to it being the 54th anniversary of an airplane crash in Munich which killed 8 Manchester United players and 3 staff and injured 9 other players as well as the team manager. Among serious Manchester United fans this event and date are well known despite it happening so long ago. With a great talk such as this, our minds just percolated with ideas and questions. I asked whether MITRE had applied for a patent since the possible applications from finance to politics were simply stunning and the answer was ,"Yes," -- see here. One of my colleagues, Dr. Ryan Wright, asked a question about acceleration, which I thought was really interesting -- for example, could the model and algorithm track herding/crowding behavior? Dr. Rod Warnick of our great Hospitality and Tourism Management Department also asked a great question about seasonality with reference to Google as did several of the students. My colleague, Dr. Senay Solak, continued the conversations. The discussions lasted as time just flew by until close to 4 o'clock and I think the students from the Isenberg School and the College of Engineering that came as well as the faculty will never forget this talk. We thank Dr. Les Servi for the clarity and brilliance of his talk! The previous time that Dr. Servi spoke in our series was in the Fall of 2006 when he talked about tracking pirates (and that was even before such activities hit the news). Special thanks also to Dr. Bruce Weinberg, the Chair of the Marketing Department at the Isenberg School, and a social media star, and to Dr. Weibo Gong of the Department of Electrical and Computer Engineering at UMass Amherst, whose PhD advisor at Harvard University was Professor Larry Ho (also Servi's advisor), who joined Dr. Servi and me for lunch at the University Club. After lunch, Dr. Servi and many others joined us in a celebration of the 3 awards that we received at the INFORMS conference in Minneapolis. The cake was delicious and the company simply wonderful with even Dr. Amir Masoumi joining us from Manhattan College. What a great time to be an Operations Researcher living in an era with a proliferation of data. What information will the data reveal and what new discoveries?! And as Dr. Les Servi said, Philip Morse, a pioneer of Operations Research, would be very pleased.